I am a little upset, and I am sure anyone that ran the Teach First 2012 Challenge 10K will also be when they find out that the route was short 400m at least. I did think this was particularly easy, and everyone I know there registered Personal Bests for the distance however, after talking to a few other racers with Garmin GPS watches the following became apparent: The route was short. You would have thought that a teaching charity, where most of the runners and volunteers were teachers would be able to read a simple map? Well, I guess not, and I weep for the future. Clearly no one is going to learn anything in geography class in the coming decades. And so to the proof. 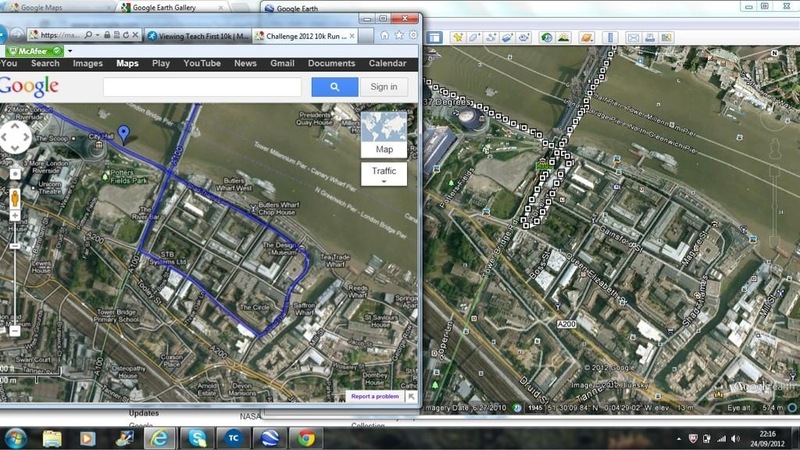 On the left is the mapped route as per the charity website, that would equate to a full 10K. On the right is the GPS mapped route, missing out 6 city blocks. I remember this part of the race distinctly. We has just run south off of Tower Bridge, and turned left then saw a female marshal who pointed us left again to more a couple of blocks straight ahead (north). The two marshals ahead were looking up the way we were supposed to have run and I am sure there was a little confusion and smiling – but then all the marshals were young teachers, or teaching students and were all bouncy and smiling, so I could be wrong there.. Regardless of if they were aware of the route being wrong or not, the Race Director is responsible for making sure it is right. Shame on you! You have disappointed a lot of people who were proud of their achievements, be they their first 10K or a personal best.